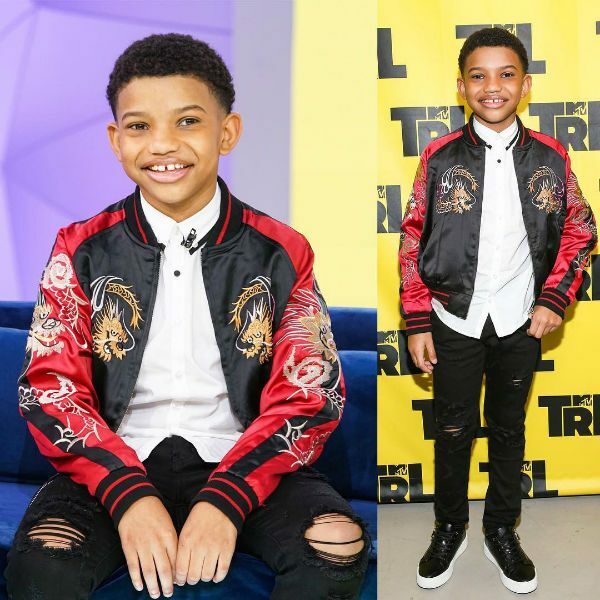 Actor Lonnie Chavis from NBC's “This Is Us” was spotted wearing this Karl Lagerfeld Kids White Shirt & Haus of Jr Wyatt Souvenir Jacket at the MTV TRL Tune In – Total Request Live Show on February 29, 2018. This cool streetwear look for boys features this sharp white shirt by KARL LAGERFELD Kids, made in soft and smooth cotton. It has contrasting black trim on the pointed collar and the designer's logo on a black metal tab on the chest pocket. Lonnie completed the look with a Haus of Jr Wyatt Souvenir Jacket & Ryder Black Ripped Denim Jeans. Photo Source: Instagram.